We will be closed beginning Thursday, September 13, through Sunday, September 16. 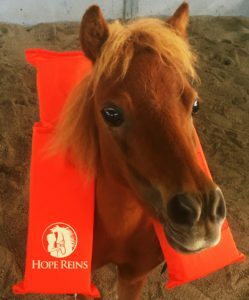 Thank you to all of our supporters, volunteers, and families we serve for your concern over the well-being and safety of the Hope Reins herd during the impending hurricane. We’ve prepared the ranch property to be as secure as humanly possible for all the horses, including shelter, water, food, fencing, and enough open space, which allows them to instinctively move out of harm’s way. Our Ranch Manager, Brandon Wert, and his family live on site and will monitor closely the horses and ranch pastures as Florence moves through. We will be closed beginning Thursday, September 13, through Sunday, September 16. We ask that all volunteers stay safely at home (unless directed by your Staff Team Leader) and do not attempt to visit Hope Reins. We will update you as the hurricane progresses and ask you to pray for our sweet angels in horsehair as well as everyone affected by this natural disaster. Stay well – and see you on the other side of Florence! PS. Hoofin’ It for Hope, our big fundraising hike September 22, will take place unless otherwise noted. See you there! Praying for this wonderful ministry that the worst of the storm will not reach it.